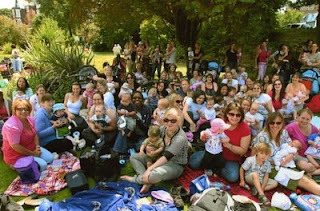 As we announced last year, we’re changing the time of the Breastfeeding Picnics, from a weekday to the weekend. We had run them, concentrating on Westminster, during the last week of Parliament before the Summer Recess. This was to allow members of both the Commons, and the Lords, to attend. 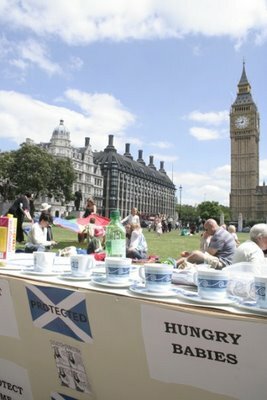 However, we found that most MPs reported they’d be more likely to make a local picnic, in their area, over the weekend. And that many Mums felt they couldn’t attend mid-week. This year’s Picnics will run over the Weekend on June 18th and 19th. It is up to the local organiser, if they go for the Saturday or the Sunday. Most will run for 3 or 4 hours, with a very fluid drop by between x and y, times. Breastfeeding picnics, are just that: a picnic, usually in the park. You choose a spot, tell everyone to turn up, and go have fun in the sun. You also invite your local MP, and tell the local media. 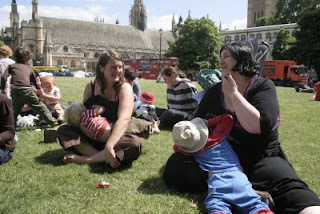 The point of the picnic is to raise awareness of the need for proper protection in England & Wales, for breastfeeding (and bottle feeding) babies. Scotland has excellent protection, and we want that protection extended to the whole of the UK. Despite comments that England & Wales, Northern Ireland, The Isle of Man etc, cannot possibly bring in legal protection as civilisation as we know it will end… Scotland doesn’t seem to have experienced any problems at all. Everyone know babies and infant get fed, when they are hungry: end of. Any baby, any milk, any caregiver. Simples. So, keep out for a list here, on the picnics running in June, and ask yourself if you want to run one. Running one couldn’t be easier. Just decide the place, and let us know. We’ll send you a couple of information sheets, giving tips on what to do. You can also join the Facebook Page, and hold your own ‘even’t page from there: http://www.facebook.com/group.php?gid=18703668386 but the help to set up comes from the yahoo space. It doesn’t matter how big, or small, a Breastfeeding Picnic is. All that matter if that Mums and Kids get together in the sun,and have fun, and raise the awareness that breastfeeding is a perfectly normal OUTDOOR activity. We’d especially like some more in Scotland, as it is about everyone having the same rights.